WordPress is one of the best blogging platforms due to its simplicity and flexibility since 2003 and WordPress covering more than 90% blogging website. 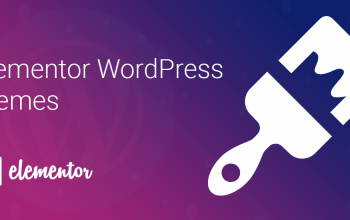 WordPress offers the wide range of simple customization options so that even a layman can create a website easily. Based on recent data WordPress powers 29% of the total website and more than 45% on Content Management System (CMS). 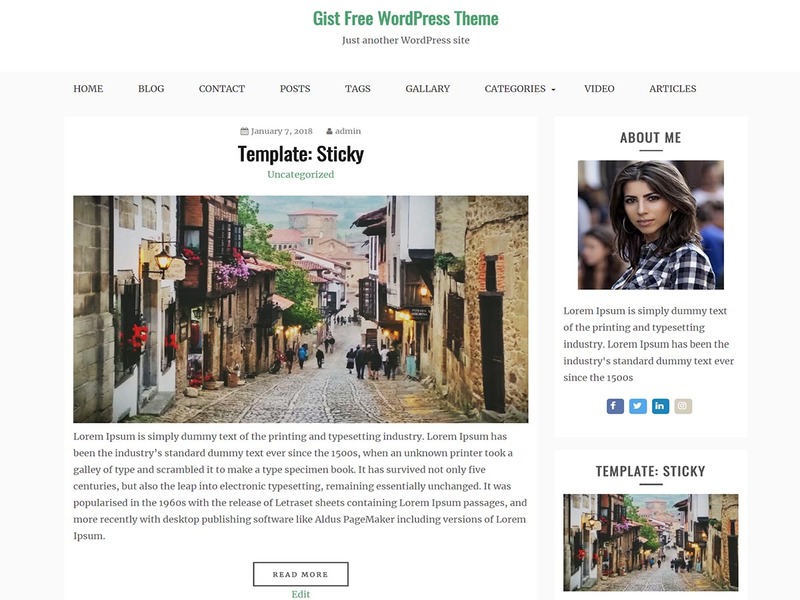 WordPress has free WordPress blog themes and they are really incredible. If you are planning to start a blog or want to change the design or theme of your existing site, you can choose any of the available themes for your website. Literally, there are thousands of theme available for free. You can choose any of them. If you need additional features, dedicated supports, and updates you can choose premium version as well. If you are wondering how to choose the best theme for your website we are here to help you. No wonder there are plenty of beautiful, clean and lightweight theme available – designed and developed to create your website professional looking and visitor friendly. So we have handpicked only the best themes available on the web. 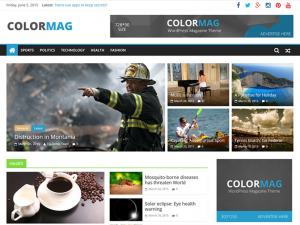 ColorMag is one of the popular themes on WordPress with active installs of 100K+. ColorMag is specially designed for Blog, News and Magazine sites. ColorMag is developed by ThemeGrill. Its design is also well suited for online magazines, newspapers, and other publications, but it can be used as a multi-purpose theme as well. Writee is a free version of WordPress theme for blog sites. If you are planning to develop best and visitor friendly blog site, Writee theme may be the best choice for you. 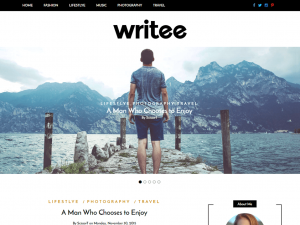 Writee is very flexible and well suited free blogging WordPress theme for personal, food, travel, fashion, corporate, or any other amazing blog. Writee is fully responsive and mobile friendly. This theme is clean and minimal WordPress blog theme with the premium look and feels well suited for food, fashion, travel, lifestyle, sports and any other awesome blogs. Activello is highly crafted theme with highly added useful features. 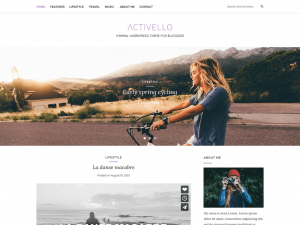 If you are looking for the perfect theme for your blog, Activello is one of the best one. More than 20K+ active users are using this free version. 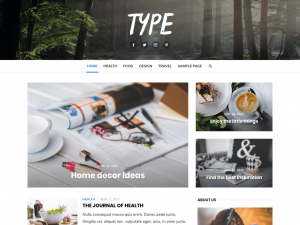 Type is a professional blog, an online store or a magazine style website with elegant design and quality codes. Type lets you easily combine 4 Header Styles, 3 Layout variations, Sidebar Position and more. Quickly upload a Custom Logo, create an impressive Header Image, showcase your Featured Posts and see the preview in real-time. 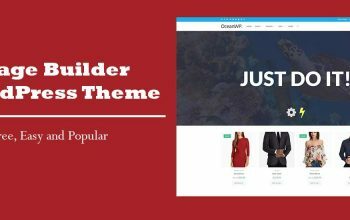 The Theme includes also a basic support for WooCommerce plugin. 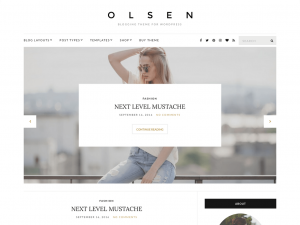 Olsen Light is the perfect theme for blogging website in WordPress. This theme comes with an awesome slider, search options, social media links, sidebars options, author widgets and many more. If you want to develop a new blog website or want to redesign it, you can use this theme. This theme is obsoletely free and you will get the best support even in free theme. 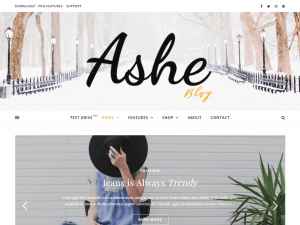 Ashe is Personal and Multi-Author Free WordPress Blog Theme suitable for blog, news and magazine sites. In addition, it is also perfect for personal, lifestyle, food, travel, fashion, corporate, photography and any other kind of amazing blogs. This theme comes with well document and very easy to use even for WordPress beginners. Clean and Modern Responsive design will perfectly showcase your content on any device. You just need to write and be awesome! 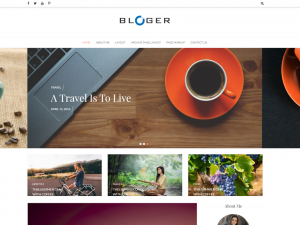 Blogger is a simple, clean and minimal blog theme suitable for personal or professional blogs, company or organization blog websites, news, magazine websites theme developed by Accesspress Themes. This theme is Fully responsive, bbPress compatible, translation ready, cross-browser compatible, SEO friendly, RTL ready. No coding required at all to create a complete blogging website. Great customer support via support forum, online chat, and email. Try this awesome and elegant theme today. 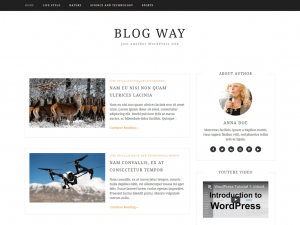 If you are looking for minimal WordPress blog theme, Blog Way will be your best choice. This responsive theme is best to use for blog, travel, informative and life style coaches. It comes with the option to change the color of an entire site, author profile widget, social links to connect with social networking sites and more. It supports Woo-commerce and can be used for perfect e-Commerce sites too. It has the premium version with extended features. It is a highly crafted blog theme developed by Promenade Themes. 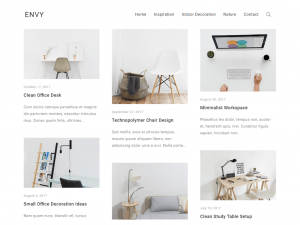 Envy Blog is clean, modern & minimal WordPress theme with responsive design and beautifully designed theme perfectly for blogger. Suitable for Personal Blog, Travel Blog, Niche Blog, Corporate Blog, Marketing Blog, Fashion Blog, Organic Blog, Foods Blog, Magazine and/or any kind of blog. This is lightweight theme with minimal design and quality codes. Placid is highly crafted theme for Blog and Magazine. 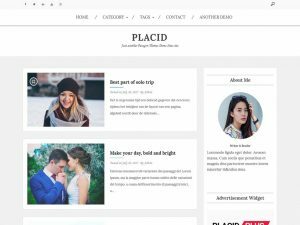 Placid is a simple, easy to use, modern and creative, user friendly WordPress theme. In addition placid is responsive, cross browser compatible and child theme ready. Placid comes with added custom widgets for social and author, sticky sidebar options, footer widget, sidebar options, meta option, copyright option, search option etc. The gist is best ever crafted free WordPress theme for Blog, news, and Magazine. The gist is a simple, easy to use, modern and creative, user-friendly WordPress theme with typography, fonts and color options. The gist is the first theme developed by Candid Themes although this theme is meticulously developed by their experts’ team. It’s clean and minimal design, quality codes, responsive and mobile friendly design are best factors. If you need more added features, you can use premium version of gist. 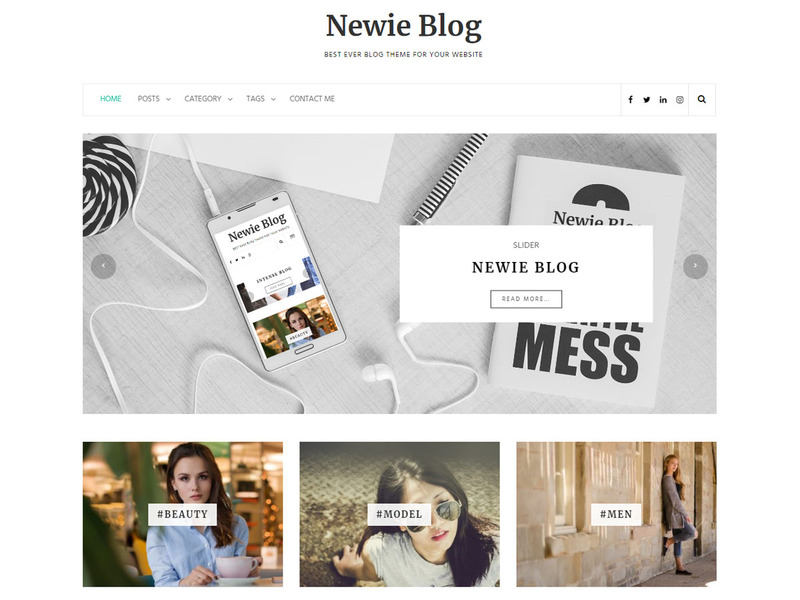 Newie is simple, clean and elegant WordPress Theme for your blog site. This theme comes with the slider, promo section, copyright options and social options. In addition, this theme has added the custom widget for the recent post, author, and social menu. Use this awesome WordPress theme for your blog site, you will never look for an alternative. 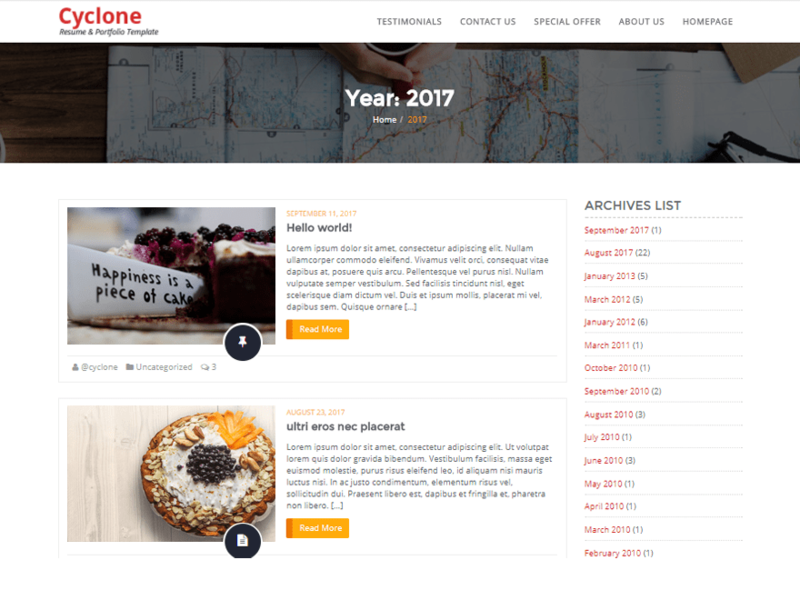 Cyclone Blog is a best, beautiful and minimal blog theme designed for bloggers to make different types of blogs including photography, food, fashion, lifestyle, magazines, travel, sports, technology, and many more. This theme is developed by trusted developers to make your stunning beautiful website. It is a powerful blog theme with plenty of features, user-friendly customization and personalization options. If you are looking for best and clean theme, Reef free version of WordPress theme is suitable for you. 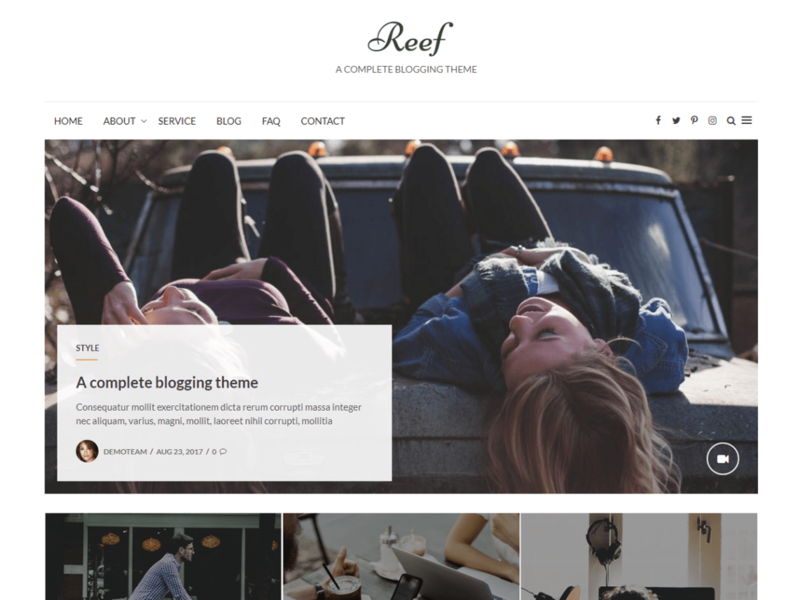 Reef is a simple, clean and minimal blog theme based on Bootstrap Framework. This is suitable for personal or professional blogs, company or organization blog websites, news, magazine websites. The theme is fully customizable and contains all the features needed for a complete blog website. 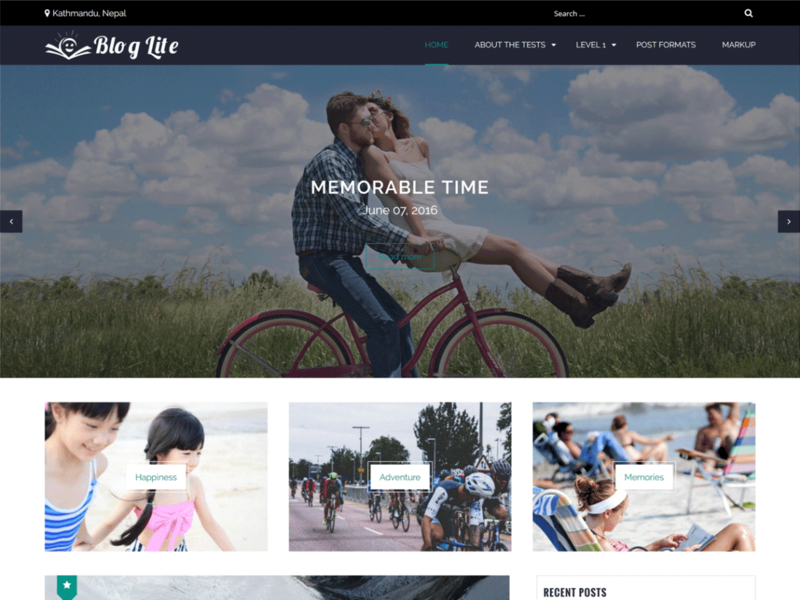 A free and responsive WordPress theme Blog lite allows you to create different types of stunning blogs and websites. It has been designed for layman to be easy to use and fast. It is perfect for any types of blogs like journals, news, photo blogging, writers, travelers, bloggers, business and other creative websites. Try this awesome product now. 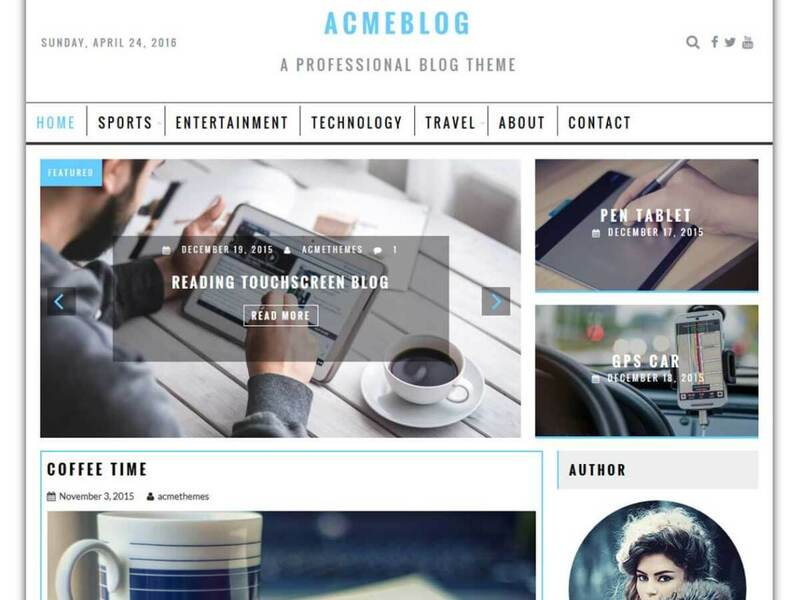 Acme Blog is clean and elegant WordPress theme for blog, news and magazine sites. 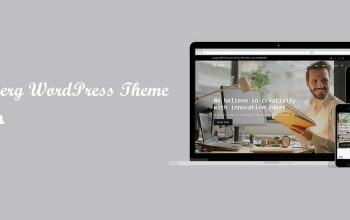 If you need clean and lightweight blog theme with a slider, related post, and sticky sidebar, this theme will be the perfect theme for you. This theme comes with a variety of features and some of them are listed below. 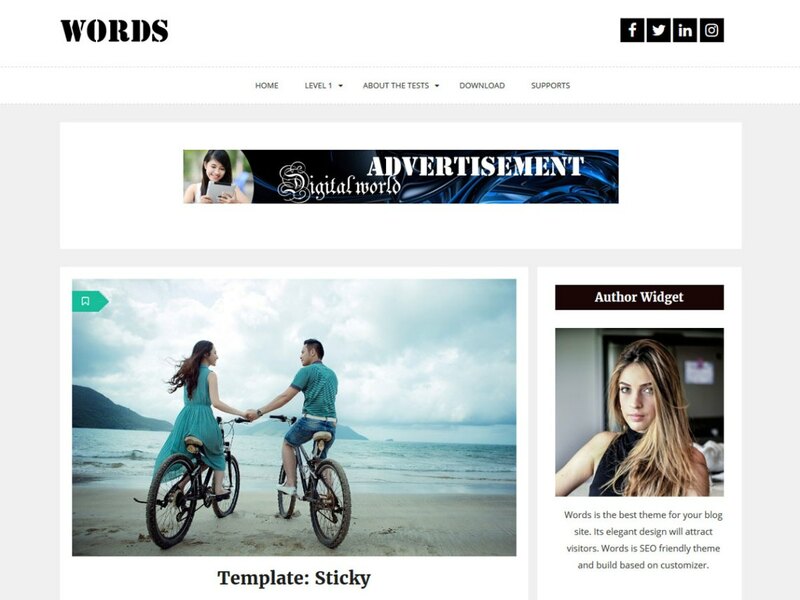 Words a free version of WordPress theme is an elegant, light weighted, tremendously intuitive, powerfully flexible and easy to use WordPress theme for your personal blog. This theme comes with a sticky sidebar, header advertisement section, social icons in the header as well as an added custom widget for author information. The visitor will love your website because of its elegant design. You can download the copy once and start using this theme Words. 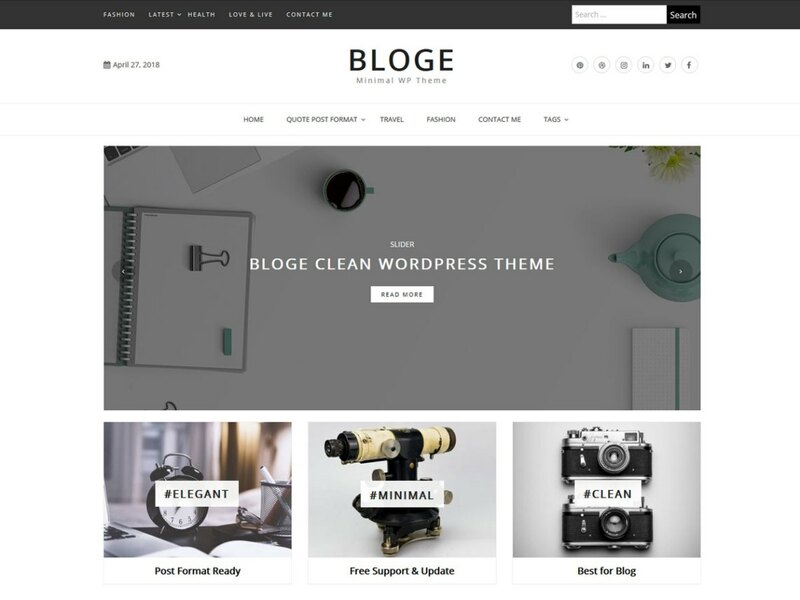 Bloge is another simple and clean WordPress theme with post format ready design. Bloge comes with various best and useful features to customize your blog site. If you are planning to rebuild or redesign your blog site, you can go with Bloge. This theme has author, featured post and social widgets, sticky sidebar, copyright text, slider and promo section and many more. 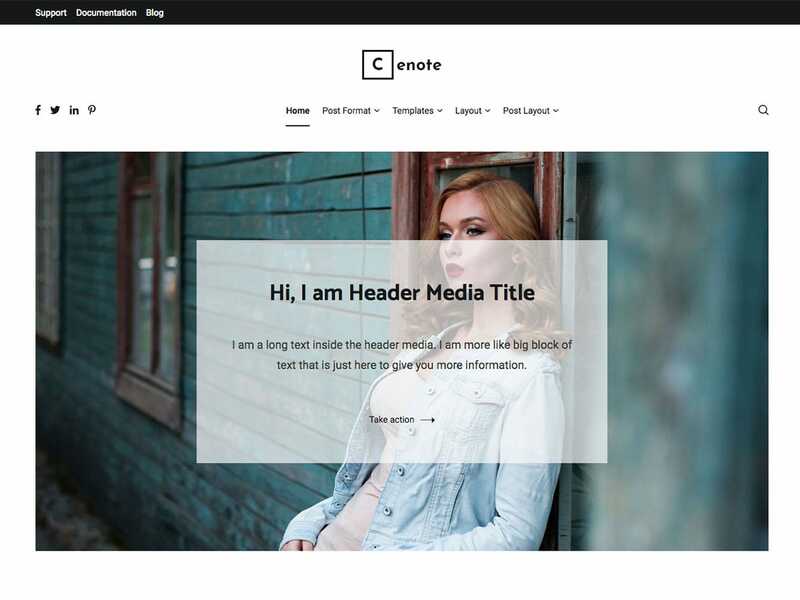 Cenote is blogging oriented WordPress themes having lots of functionality to create any kind of blog. With the added features, this theme is very easy to use and customize. Cenote comes with detailed documentation and demo import feature. It also provides color options and sidebar options. Some more features are listed below. In addition, you can get various WordPress blog themes available on WordPress dot org and in various other marketplaces and shops for free. You can choose other best blog theme and you can choose best one with the help of users review, active installs required features etc. If you have any confusion about choosing the best WordPress themes for the blog, comment us below in the comment section, we will try to help you to choose the best and suitable theme based on your requirements. If you want to add some other theme in this list, let us know we will add the best themes here in this list. Check the list of Free Corporate Themes as well, if you are looking for corporate themes.